1. What kind of Questions should I expect to see on the CCNA exam? All the information that is known about the exam is available on the Cisco Certifications pagerelating to the exam in question. The Cisco NDA forbids us from telling you anything more. This includes how many of each type of question we saw, whether or not a specific topic is covered heavily, and what specific questions we were asked. 2. How much does the CCNA exam cost? You can find the cost of the exam in your country at the above mentioned site where you register. Again, don't take anyone else's word for it. You're going to pay Pearson Vue to take the exam, not me. So it only makes sense to see what they say it costs, right? 3. How do I register to take the exam? Cisco exams are proctored Pearson VUE. You will find everything you need to know about registration and exam locations on their site. Don't just take the word of some random person on Facebook, get the information directly from the authoritative source. 4. What book should I read for the CCNA? I've blogged about this before very recently, and you can find that post elsewhere on my blog. But to summarize, I'm always going to recommend the Official Certification Guide from Cisco Press. I don't care if someone said Wendell Odom is too dry, or the books are too long. There's a lot to know, and you may as well understand now that there are no shortcuts. Many like Todd Lammle's book because it's shorter and it reads more like a stand up comedy routine. First, Lammle assumes you have a certain level of knowledge already before you pick up his book. Odom doesn't. Lammle gives you the bare minimum needed for the exam. Odom doesn't. If passing the exam is your only priority, you're in for a rude awakening on your first day on the job. The router that's down isn't going to go easy on you because the root cause wasn't a CCNA exam topic. You can find a large list of free resources around the Internet to assist your studies. 5. I have a question about my final results. There's a great post over at the Cisco Learning Network titled Demystifying the Cisco Score Report. It says it's posted by the Certs & Lab Admin, so I'm going to assume this is legit. And while this particular breakdown is for a CCIE Written exam, pretty much everything that is said in the post applies to any written exam. 6. What degree should I get for networking? Nobody can speak for every hiring manager out there. Every one is different, so there is no answer for this. In my experience, a college degree was a yes/no question without too much focus on what the degree was in. Some hiring managers don't care about a degree while others only care that you have one, and others still want it to be something specific. I chose a degree that closely matched the work I wanted to do in the future. You can't go wrong with that way of going about it. One thing I can guarantee is that nobody is looking specifically for somebody with a masters in Botany to work in their NOC. 7. Why did I get banned from the CCNA group? The group has rules, and the rules are enforced. Its nobody else's fault that you either posted without knowing the rules, or you knew the rules but chose to disregard them. Every Facebook group, Website, Online Forum, etc. has rules and it's up to you, the user, to seek them out and follow them. This is true with anything you do in life. 8. Will you do my homework for me? No, we absolutely will not do your homework. Do your own homework. I already know the material and your homework is one of the steps involved in your education. You want to pas the exam and earn the certification? Then you need to learn this stuff, not just write down what I told you. Obvious homework questions will be deleted, and the poster will be mocked. I don't care if you say it's not homework, we know homework when we see it. Besides that, half of the "answers" I see given to homework questions are wrong anyway. 9. Which certification pays more, Cert A or Cert B? Follow your heart, not your greed. If you want to strike it rich, maybe come up with the next Google or Facebook. Every certification path has great opportunities, and you'll be paid well in any IT specialty if you do your job well. And you will do your job a lot better if you're doing something that you actually enjoy doing. If you don't know what you enjoy doing yet, you should be spending more time getting a job and gaining experience and less time worrying about 3 jobs ahead. Bottom line, if it wasn't a marketable job skill, Cisco wouldn't bother maintaining a certification program for the skill. This question, and any basic question like it, doesn't have any place in a Facebook group or an online forum. It's something that you can easily Google, and not waste everyone's time. In case you're still unsure how, I wrote a post on how to Google things. Try it sometime, you may like it. "What is the CCNA" is especially offensive. Why did you join our group if you don't even know what it is? If you don't know, then Google it. When in doubt, try this post on how to ask better questions. Better questions get better answers. Take note when you will not show any router configs but still want us to figure out why can't ping across your 5 router topology. 11. Any question that conntains "Class A," "Class B," and/or "Class C". Let me stop you right there. Classful networking is a relic of ancient days, and we simply don't use it any more. CIDR and VLSM aren't something that's off in the distant future (insert IPv6 or Duke Nuke 'em Forever joke here), they are the here and now. If your "practice test" or study guide that you obtained from some shady website talks about classful networking, you're going to fail. 12. I don't like the rules, who can I complain to? Basically nobody. The admins set and enforce the rules. And as long as we do not violate any part of Facebook's TOS, that will not change. If you dislike the group that much, there's certainly other groups elsewhere that you would like better. Try one of them. Of course, if you do want to scream at somebody, then by all means send me a private message on Facebook, even if it was a different admin that annoyed you. I've actually grown to enjoy the abuse. 13. I was treated unfairly by an admin, who can I complain to? See question #12. I have nothing but respect for the other admins of this group, otherwise they wouldn't be admins. It's not very likely I'll take your side over them. But again, feel free to scream at me all you want on Facebook. I love the abuse. 14. Will the CCNA help me find a job? The same goes for this as it does for the degree question. While experience trumps all, certifications and a degree will help you stand out from other similar candidates who you are otherwise similar to. But at the end of the day, it's up to the individual company to decide what they want in a candidate. Some want a degree, some want certifications, some want something else still. The job posting will tell you exactly what they're looking for in a candidate. The bottom line is that having a degree and a CCNA helped me get my first job in I.T. Everyone had zero experience at one point, and yet the senior members of the group are all working in the field, right? 15. I has cert, job me now! Sorry, but this isn't a jobs board, and these types of posts can and will drown out everything else if we allow them.. Since there's really no such thing as a "CCNA Job" despite what many posters say, there's no connection here. If you wish to explore career opportunities in your area, seek out a group dedicated to that topic. 16. I'm the network administrator or engineer and everything is broke. Help me! Let me guess, you passed the CCNA by using Testking, and somehow lucked your way through the job interview. The hiring manager must have figured they could pay you less since you really didn't interview well. Now you see why you shouldn't have cheated. You can't afford my hourly rate as a consultant, so pick up a book and start learning. You're in for a long night. While reading through a discussion on Slashdot today, someone linked a thread from 1999 as proof that the Slashdot community has always been pretty dumb collectively. The thread was on the upcoming release of VMWare, a class of products that clearly hasn't been heard of on PCs at the time. The thread can be found here. It's amazing how a concept so ingrained today appears to be so foreign just 18 years ago. My personal favorite is the very bottom comment "a great idea ROFL." IPv6 is one of those technologies that I've been wanting to dig into further. I know enough that I can get through the certification exam of the day with a little book time to refresh, but I don't know it well enough. It's not something I've been avoiding, just something that I've kept putting off because something was more pressing, more interesting, or potentially more useful. So there's no time like the present. Let's get started. I began by reconfiguring the network to better align with all the blog posts and docs that I've read to date. I originally had the 3750 doing the intraVLAN routing, but I decided to simplify and push everything out to the 2821 at the edge for now. So the 2821 and 3750 are doing router on a stick. There are 2 VLANs I'll be using (10 and 20 for now, additional VLANs are there but not IPv6 enabled yet), so the /60 Comcast is currently handing out that can be broken down into 16 /64's will suffice. I think a lot of areas are getting more than a /60, but it's more than enough for now. On the 2821, we'll start by enabling ipv6 routing. Naturally, the commands are a bit different here and there. Then on the outside interface, we'll pull our /60. If your ISP is handing out bigger chunks, adjust your hint accordingly. First we enable ipv6 on the interface and then pull a /60 and put it into a pool called COMCAST. In a lot of other docs online, I see the addition of "ipv6 address dhcp" added on the outside interface as well. But my router/IOS combination wouldn't take that command and it's working fine without it, so keep this in the back of your mind. Next, we'll go onto the inside interfaces. We'll set up the IPv6 addresses and have a little ROAS review here too. What we've done here is put the first /64 from the COMCAST pool onto VLAN 10, and the second /64 onto VLAN 20. The next line on the interface sets up the dhcp options for the two VLANS. The only options that I've currently configured are the DNS servers. I'm actually using my own Domain Controllers (which is what you should use if you have them), but for here I'll put in Google's. There's some timers that may need tweaked in regards to neighbor discovery, but that's a little beyond my understanding at this point. I'll get into that at a later date. So now we have full IPv6 connectivity on just about everything in the lab (for some reason, none of my Virtualbox guests can ping past their own Ethernet NIC, but that's a topic for another day). 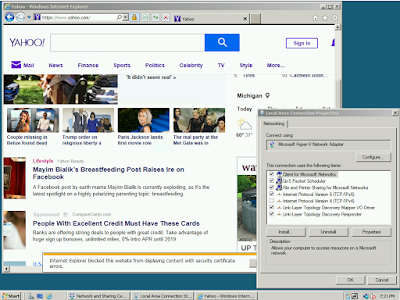 I've disabled IPv4 completely on a test machine (Server 2008 Enterprise) and loaded up Yahoo. So far so good. We've got connectivity. The NIC settings are shown to demonstrate that IPv4 is indeed disabled. What's next? I would like to move intraVLAN routing back down to the 3750 and have a single routed link between it and the 2821. Then I want to move the DHCPv6 functionality for each VLAN down to the domain controllers so I can manage all the IPv6 bits with Windows IPAM as I do now with the IPv4 bits. And finally, I need to update the IOS on my 3750 to an image that supports IPv6, among other shortcomings I'm currently hampered by. But first things first, I'm going to move my Hyper-V servers from Server 2012r2 to 2016 and finally get them into a failover cluster. Between that and getting some shared storage together for the cluster should get me through a good section of the MCSA 2016 topics. Tokelau is a self-governing territory of New Zealand consisting of three coral atolls in the southern Pacific Ocean. It lies north of the Samoan Islands, east of Tuvala, south of the Phoenix Islands and northwest of the Cook Islands. It's believed that the islands were first settled approximately 1000 years ago. Tokelau is a free and democratic nation with no political parties, holding elections every 3 years. And Tokelau is the first 100% solar powered nation in the world. So why the interest in this small group of islands in the Pacific? Well, it's not the islands, the nation, or even the people per se that interest me, it's their ccTLD, .tk that I have recently become aware of. Tokelau allows any individual to register a domain under this ccTLD, and with few restrictions (such as sexual, drug, hate and firearms content), users and small businesses may register any number of domains free of charge. "Special" .tk domains, such as those containing the trademark domain names for most Fortune 500 companies must be purchased. Users may also opt to forward their web and email traffic. The nation of Tokelau boasts a population of 1,499 as of the October 2016 census, good for 237th in the world. What makes this small population most remarkable is the fact that more than 28 million domains have been registered under the .tk ccTLD. According to a McAfee survey in 2006, .tk domains were twice as likely to be used for "unwanted behaviors" when compared to the global average. In 2010, the Anti-Phishing Working Group noted that 21.5% of all worldwide phishing originated from .tk domains. So what does this mean for you? Have you ever done legitimate business with a person or organization coming from a .tk domain? I can't say that I have. And other than the free domain registration (which hardly matters with what GoDaddy and other registrars are selling domains for these days), why would anyone want to register their domain with such a small, and otherwise unknown nation? They claim to have rules, but are clearly not enforcing them. And how could they with 28 million domains and counting registered? As of right now, it's probably safe to just blacklist the entire .tk for now. Saturday afternoon, I took the CISSP exam and passed. Not only is this a sweet certification on my resume, it's the final requirement for my Masters degree. So all in all, a pretty awesome weekend, even though it was quite stressful leading up with so much riding on this exam. So the first thing that stands out on this exam is just how long it is. 250 questions long and by far the longest exam I've ever taken either for a certification or in academia. I'm normally a fast test taker, and it still took me around 2.5 hours to complete. I can't even imagine someone who is a slow test taker and up against the clock. My road to success on this exam is not for everybody. In 2008, I decided to use what I had left of GI Bill eligibility and make a career change into I.T. Some of my earliest classes were infosec related, and I first read Shon Harris's incredible CISSP All-in-One Exam Guide somewhere in the neighborhood of 2009 as it was the textbook for a couple classes. From there I went on to study Information Assurance at Eastern Michigan University, earning a Bachelors in 2012. Many of these classes focused around CISSP topics. Three years later I went back to Eastern to pursue a Masters degree, and many of these classes also focused on CISSP topics. Everything from a class on Risk Management in my undergrad days, through graduate classes on Business Continuity and Incident Management recently. For the capstone of my Masters program, I chose the option of taking this exam, and dedicated the semester to studying for it. Over the course of the semester, I read Eric Conrad's CISSP Study Guide and Adam Gordon's Official Guide to the CISSP CBK, both on Books 24x7 (thanks EMU!). I also watched a great video series on FedVTE (thanks government contracting position!). I took it one domain at a time, first reading the chapter in Eric Conrad's book, watching the video, then reading the chapter in Adam Gordon's book, using each sources practice questions to gauge my progress before moving on to the next source. Along the way, I kept notes on my strong and weak points of each domain (a learning log was a requirement of the class, otherwise I may not have) and spent the last couple weeks of the semester reviewing all the areas I wasn't comfortable with. For anyone considering taking the exam, know that this isn't like your typical Cisco or Microsoft exam. For those, you can almost always find a seat at a nearby testing center on the day you prefer to take your exam. Not so with the CISSP. In mid-February when I went to book the exam, I could find a couple seats in early March (way too soon!) or mid to late April, so I took it April 15. My due date to present proof of passing was April 17, so there was no second chance. So if you're up against the clock, either for work or school, book sooner than later. I also ended up having to go with a testing center that was a little over an hour drive from my house, where as the one I normally go to is 15 minutes away. I'm assuming it's the 6 hours you get for this, but there simply isn't a lot of available seats for this exam. At least in early 2017 for the Detroit and Ann Arbor areas. So no rest for the weary, its on to the next thing. I'm initially leaning towards getting the "Upgrading Your Skills to MCSA: Windows Server 2016" knocked out now before Microsoft drops all the 2012 exams off of the list of available qualifications for partner status. That wasn't a fun scramble when they dropped the 2008 exams. Without school taking precedent in my mind, I probably won't take 6 to 9 months to prepare for a test this time. Here's just a quick little blurb about a problem I ran into this morning. The cables for my SAS controller FINALLY arrived yesterday, so I installed them last night. With the additional storage now available, I moved a couple VMs over to give the existing datastore some breathing room. It's not a very intuitive process, you have to browse the datastore, right click on the folder containing the VMs files, and select move. From there, you'd think ESXi would be smart enough to figure it all out, but you'd be wrong. I had to remove the VM from inventory, then add it back in from it's new location. But that's not the end of the fun, both of the ones I moved got stuck at 35% when powering them back on. So here's what happened because you may not see the problem right away. 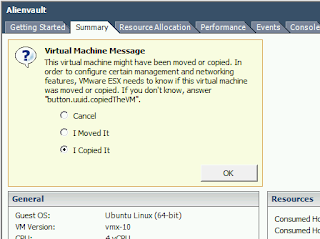 When I clicked on the summary for the VM (Not the default tab when you go to the VM in the vSphere client), you'll see a bright yellow box asking if you moved the VM or if you copied it because it knows you've done one or the other. I selected "I Moved It," and then the VM's finished starting up without any further delay. Because I'm currently focusing on the CISSP exam, I'm going to create a new list in the spirit of my most popular post so far, the Free CCNA Resources 2.0 list. Because I want to share it with the rest of the class in my Masters Degree Capstone course, I'm going to go ahead and post it now while it's still a little rough around the edges. With that being said, I will not include anything that is only freely available to Eastern Michigan University students or government employees and contractors. It's going to be a living document, more so than my other resource lists. A lot of these are coming right from a couple CISSP study guides I am using on Books 24/7, and a lot of these are coming from my own time spent on Google. Like most people, I get an occasional call from an unknown number on my cell phone. Most of the time I ignore it, especially if they're calling while I'm at work. But if I'm bored, I may Google the number later. And it seems like every time that I do, it's a different group of 5 or 6 "who calls me from" databases that show up in the top hits on Google. It appears that the call I got was from someone trying to sell extended car warranties this time, but what really caught my eye was some of the comments regarding this number. Aside from the atrocious spelling and grammar, there's some real gems. Also enjoy the DMCA notice from the web sheriff.